Out west, where the sun is unafraid to make itself known, weekends are consumed with outdoor activities, restaurant outings, concerts, and a desire to explore and experience new things. I’ve lived in San Francisco for a year, and the city has unfolded for me, layer after layer, one person, place, and pursuit at a time. It’s a city that’s always giving when it comes to new experiences, and a place where people are in pursuit of happiness in a way I never felt on the East Coast. In the stereotypical East Coast-West Coast juxtaposition, the East is described as a fast-paced place where the weather and humans are cold and frenetic, whereas the West is seen as slower-paced, with the climate as agreeable as the people. It’s a tale of two notably different cities, yet I’ve seen an intensity in San Francisco akin to New York, albeit manifested in a very different way. In the stereotypical East Coast-West Coast juxtaposition, the East is described as a fast-paced place where the weather and humans are cold and frenetic, whereas the West is seen as slower-paced, with the climate as agreeable as the people. Despite an easygoing impression, people on the West Coast are ambitious, no doubt. In Northern California, home to many startups and global technology companies, business is cutthroat—startups have to be if they’re going to make it past their Series A round of funding. That means late nights spent hunched over screens, progressing the company one actionable idea at a time. But there’s another dimension to the West Coast culture, one I’ve had the luck and pleasure to indulge in. While people apply themselves to their work, there’s also a fervency around living a whole and balanced life outside of work. In what feels like a very active decision to chill out after work (and by chill out, I mean be super active), San Franciscans are quick to fill their days and evenings with everything the city and its outlying areas have to offer—beaches, redwood forests, mountains, and vineyards. 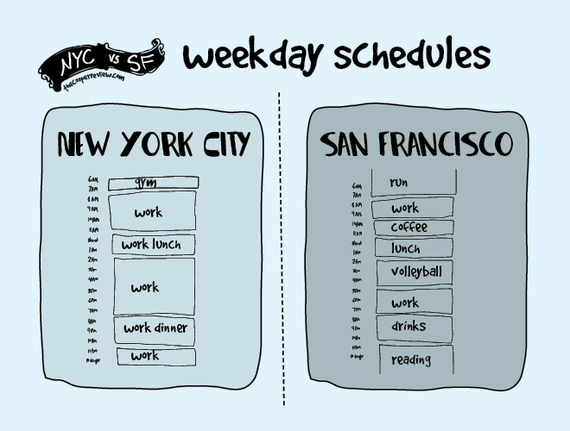 Sarah Cooper’s “The Difference Between Living in New York and San Francisco”—taken from The Cooper Review—depicts everything from differences in the weather to weekday schedules with wildly accurate and comical illustrations. I’m not saying everyone on the West Coast lives like this (absolutisms are foolish), but there is a high awareness here to appreciate life outside of work accomplishments and to define oneself outside of a job title. It must have to do with the year-round mild weather and the range of beautiful landscapes all within a short distance from the city. At first, I thought I was using every free second to explore California because I was essentially a tourist to the area, photographing every redwood in sight. But then I realized I wasn’t that adventurous—everyone seemed to be doing the same amount of exploring, even the people who grew up in the area. Wellness and a balanced life are simply a state of mind here. I’ve been swept up and overwhelmed time and again with how intense and ambitious people are in fulfilling areas in their life that spark joy both at work and outside of work—in the best way possible. And I’ve even found a new hobby or two as a result, like surfing and backpacking. I’ve been swept up and overwhelmed time and again with how intense and ambitious people are in fulfilling areas in their life that spark joy both at work and outside of work—in the best way possible. While there’s undoubtedly a contagious outdoor state of mind, people still work and have career aspirations and want to succeed at work. So how exactly does this type of culture affect the work world? Get outside, and off email. With a common penchant for health and wellness, there's more wiggle room to leave work in time to catch the sunset. Since we can all be reached online, via our devices, we sometimes leave work a little early for yoga, or a run in the park before the sun sets. Even so, don't expect to get a response to a work email on the weekend, because most people are busy being weekend warriors. To underscore that point, at Zendesk, there are Slack channels for trail running, rock climbing, surfing, and a daily workout to get the blood flowing through the limbs during the workday. It’s not cool to show everyone how hard you’re working on the weekend, so reserve the weekend emails for those workmergencies—unless you want to be that colleague. Keep it conversational and casual. People tend to be friendlier here (especially if you’re using New York City as a comparison, where even the pigeons bite), possibly because we never have to deal with extreme weather. I have found that this friendly atmosphere—along with a trend for open office floorplans—leads to open collaboration and creativity in the workplace. With a more conversational, free-flowing workspace, it feels as though there’s more room to spitball ideas. On the downside, people also feel comfortable sidling up to your desk to chat about random and distracting things, like how their mother recently tried Goat Yoga, where baby goats sit on your back and nuzzle your face as you settle into child’s pose. True story. People also feel comfortable sidling up to your desk to chat about random and distracting things, like how their mother recently tried Goat Yoga, where baby goats sit on your back and nuzzle your face as you settle into child’s pose. Another easygoing aspect of the West Coast? Clothing. Jeans are standard attire, although, I don’t recommend taking Mark Zuckerberg’s lead and wearing a hoodie to your startup’s IPO. If you’re attending a meeting in San Francisco, err on the side of business casual. Wearing your confidence is more important than blending in with the room. Be agreeable to a fault. I’ve noticed that people are less direct here on the West Coast in a way that can be detrimental in the workplace. It can be hard to get feedback, and satisfying debates often fall to the wayside for fear of offending someone. With that said, San Francisco is known for being open-minded and inclusive and that can be, at times, much more productive in the workplace. But with a predilection for keeping things kind, work projects can also risk the scrutiny they sometimes need to get better. Maybe I’m just used to brisk and blunt East Coast behavior, but it’s one thing I miss. So, West Coasters, here’s a tip from the brazen East Coast: If you want direct feedback, don’t be afraid to ask for it. And if you’re a boss, say exactly what you think. It’s not so bad. Be radically candid and elevate those around you. This outdoor-culture and type of active intensity is a unique phenomenon on the West Coast and one that filters into the workplace. I can safely say I wouldn’t be surfing before work or backpacking through national forests on weekends if I were working in New York City. I also don’t know that I’d leave work at work without worry of being inundated with emails over the weekend. While it’s not always sunshine and rainbows (I spend a lot of quality time with Karl the Fog; it’s hard not to develop a relationship with the wall of condensation that rolls into the bay almost daily), the west is a much different place to work than its counterpart—an arguably better place to work.